Whoever said real men don’t eat quiche hasn’t tried this crustless quiche recipe! Because it’s full of the tastiest, protein packed and delicious low carb shopping list ingredients: from pancetta to mozzarella, to heavy cream and yellow onions. 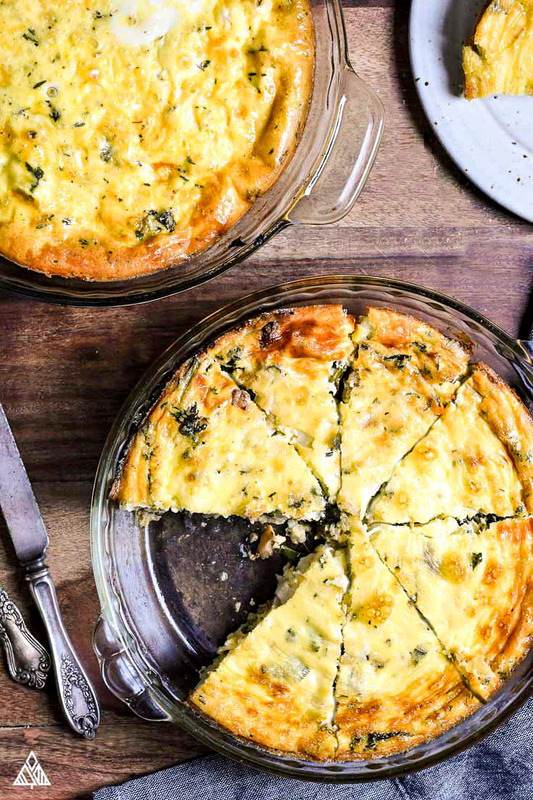 This quiche is the perfect breakfast, for manly men and fancy baby showers alike! So grab your pie pan, and let’s get crustless quiche makin’ friends! Crustless quiche is exactly what it sounds like — the delicious, cheesy, meaty quiche filling, without the crust! While means less carbs, less work, and more of the good stuff. The one important note to make about crustless quiche, is that you can’t use a tart or quiche pan to make it — the bottom of traditional quiche pans aren’t attached, and this quiche has no crust to hold the ingredients together. So save yourself a giant mess and use a pie pan or casserole dish when baking this quiche! Since I stick to low carb recipes, I used heavy cream in this quiche. If low carb isn’t your goal, swap this for regular milk! Crustless quiche recipes are rather flexible. Just keep the quantity of cheese, cream, and eggs the same, and mix and match your favorite meat and low carb vegetables. I often start with a basic crustless quiche recipe (eggs, cream, salt, pepper and cheese) and toss in some leftovers for a quick crustless quiche — chicken, steak or sausage are amazing! Keep the amount of protein you use around the same as the pancetta in this quiche, and be sure to cook it completely before adding. Add keto vegetables of choice, keeping the amount of veggies used the same as what’s in the recipe. Again, be sure to cook your veggies before adding them the the pie pan — this helps to release any liquid they contain so your quiche will bake properly. Although it may not seem like it, a crustless quiche broccoli, spinach or mushroom would be ruined by the amount of liquid veggies contain. 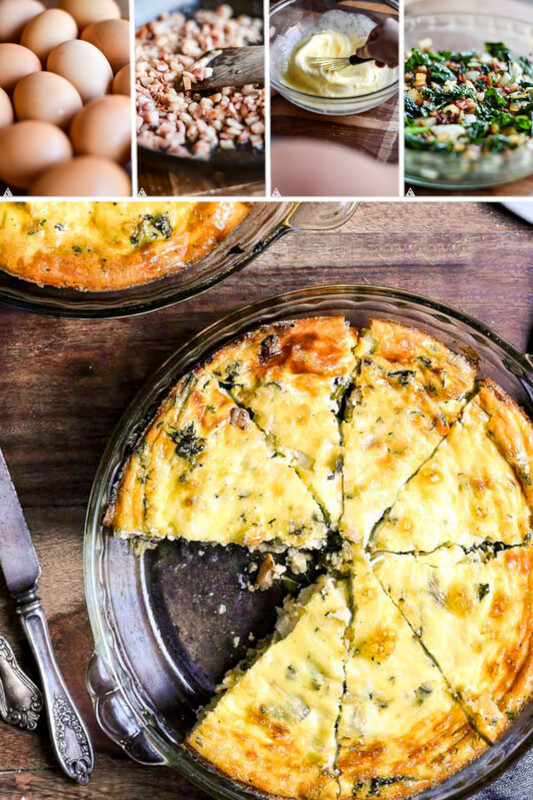 Swap pancetta for bacon, mozzarella for swiss, leave out the kale and add a dash of nutmeg for the classic of quiches: crustless quiche lorraine. Swap kale for spinach, skip the meat and double that onion for a crustless spinach quiche any low carb vegetarian would love. When it comes to crustless quiche keto, spinach is a duh, as it’s a mild tasting veggie that’s full of nutrients — but it’s also full of liquid. Be sure to cook the spinach until it’s completely wilted and place it over paper towel to absorb any excess water. 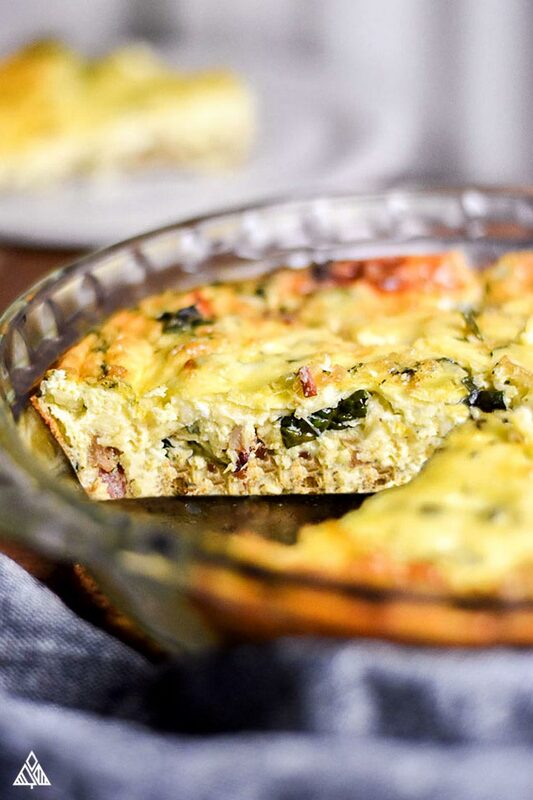 Spinach bacon quiche makes for the perfect combination of healthy, meaty and delicious! The coolest part about this quiche recipe, is how flexible your container can be. It’s the perfect mix to pour directly into a greased muffin tin for crustless mini quiche! Mini quiches are great for low carb meal prep. I portion them into resealable bags, label, and freeze. For breakfast, simply toss a few on a baking sheet and into the oven while getting ready, and viola! Low carb quiche is served! * Check out this guide for more meal prepping tips. Another easy way to meal prep this crustless quiche is to turn it into a low carb breakfast casserole. Simply double this recipe and pour it into a greased 9×13” pan. Slice into portions, put into baggies, label and freeze! 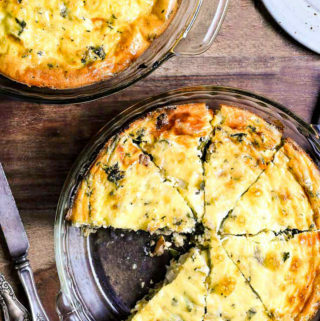 This is a great way to feed a large group of people your delicious quiche — from baby showers to brunches to graduation parties — when serving a lot of people, it’s way easier to make this quiche in a casserole dish then trying to manage a handful of pie pans! If you’ve tried crustless quiche and decided you miss the crust, then I have great news for you: This low carb quiche filling works with or without the crust. Adding back the crust, simply means increasing your bake time by about 10 minutes — you’ll know the quiche is done once the middle of the filling is solid. Looking for a low carb pie crust? Look no further than this keto quiche crust — made from a simple list of low carb foods: almond flour, butter and an egg. This crust is so buttery and delicious you’ll wonder why you ever wasted a carb on the traditional kind. 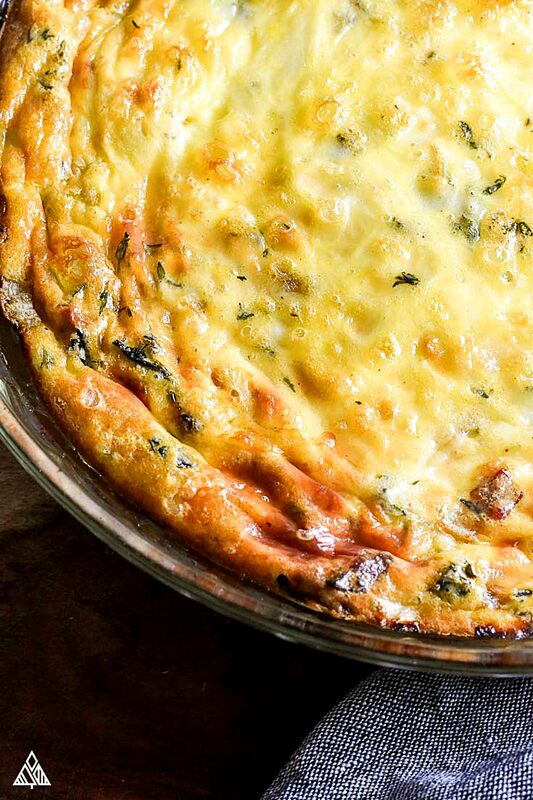 *Check our Food + Wine’s recommended Quiche pans. In my house we’ve fallen so in love with this easy crustless quiche recipe, a day doesn’t start until we’ve had a slice! Hope you love it as much as we do, leave a comment and let me know what you think! The healthy, cheesy and pancetta-y crustless quiche recipe is the low carb breakfast that's worth getting out of bed for! Heat oven to 375° and grease a 9” pie pan (quiche/tart pan won’t work for this quiche). 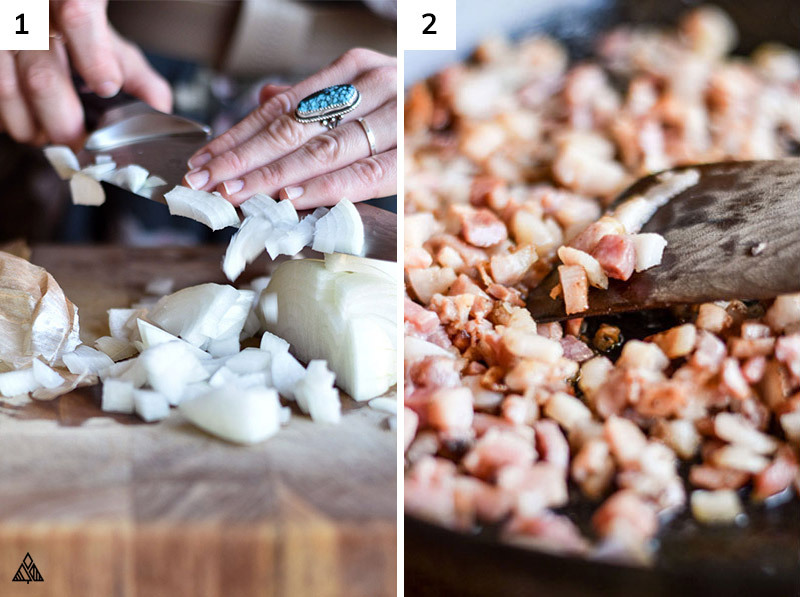 In a large skillet, add pancetta and cook through over medium heat. Once cooked, place pancetta on paper towels to absorb excess grease. Add chopped onion and cook until softened (I used the grease from pancetta to cook them in). Add kale, and continue cooking until kale is limp (you may need to do this in batches depending on the size of your pan). 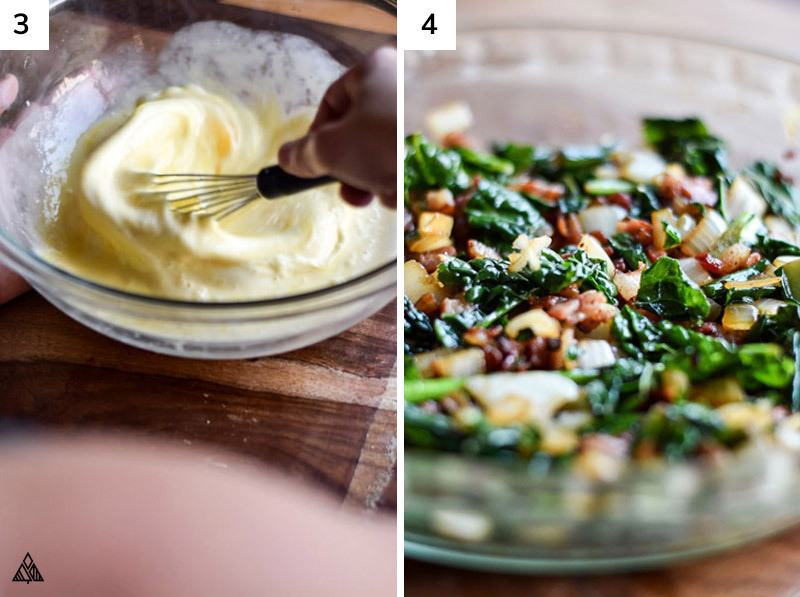 In a large bowl, whisk together the eggs heavy cream and remaining salt until combined. Stir in the mozzarella. Once cooled, stir in pancetta, kale and onions. Pour quiche contents into the prepared pie pan. Bake quiche for 20-25 minutes. The quiche is done when the edges begin to brown and the center is firm. Allow the quiche to cool for 10 minutes before cutting and enjoy! Save some carbs: cut down on or skip the onion. This quiche filling can be made inside a low carb pie crust. Bake times will increase about 10 minutes — you’ll know it’s done when the center is set. You can also double this recipe and bake it inside a casserole dish. This is really so yummy! Makes eating low carb breakfast so easy! How do I determine the carbs per serving for the recipies in your cookbook? Hi Richard! Hope you’re enjoying the cookbook 🙂 Search for the recipe on the website and the nutritional information will be at the bottom of every post! Nutritional info is based on the serving size mentioned at the top of the post. If you have questions about a specific recipe, let me know. I substituted ham for pancetta and spinach for kale….. just using ingredients that was readily available and it was quite yummy. I will definitely make this again. Thank you for sharing! !